At the time of writing this letter I noticed that a lot of changes have been made, especially with balance changes to the styles and moves within a beta test server, I think this beta test realm is a good move and I applaud you for taking this step. This letter will cover my observations regarding your balance of Protection, Weight, Mobility and Damage (PWMD). Low weight= Low Protection, High Damage, High Mobility, and High Stamina Recovery. High Weight= High Protection, Low Damage, Low Mobility, and Low Stamina Recovery. 1.A) [Observation]: In focusing on the defense moves of the 4 styles and balancing the mechanics of the attacks themselves, a simple small scope balance change has been overlooked, an update to the PWMD system. 1.B) [Problem]: Low weight characters receive buffs in three mechanically important areas, this is unbalanced. Wearing lighter equipment should not make you deal more damage. While a person wearing heavier equipment will be slower, it is common in boxing that heavier gloves deals greater damage, this is why we have weight divisions. 2.A) [Observation]: Low protection characters have more factors supporting their damage. 2.B) [Observation]: High Protection characters have less damage support. My ideas for the PWMD mechanics are simple and precise and will hopefully bring more realism to the game. Characters wearing gear with more weight should receive a damage bonus on par, if not higher than characters with lighter gear. However they should retain their heavy penalties to Mobility and Stamina Recovery. My reasoning behind this is simple, characters that invest in high weight and high protection gear need to focus their attribute points more in character stats that require ability points, as opposed to low weight characters who only need a reasonable dexterity and then their equipment handles the rest with low weight and high mobility with the knock on effect of longer dash moves and faster stamina recovery. I believe Mobility should be a damage factor at weight 15 and lower, at 16+ Mobility should have less impact on damage, the bonus should shift to more dex based characters, with strength based characters holding up the top end. Thank you ever so much for your feedback and thoughts on mobility and protection, we really do appreciate the level of detail and the time you've taken to compose your ideas! I'll pass this along to the team so they can see it too, and while I can't promise a direct reply from them, I'll make absolutely sure it gets to them. Thank you again, and please feel free to share any other ideas or thoughts you have on the game! Please be sure to bring their attention to the conclusion where each stat receives a damage bonus. For those who might comment on strength requiring a higher base number than dexterity or mobility, this is purely because Dexterity and mobility in theme and reality are very closely related, weight 16+ is where characters start becoming much slower and have higher protection values, and suffer the penalties to dash and stamina recovery. However you will also notice that in the stats the diminishing returns from one stat flow into the next, it allows for hybrid builds of Mobility/Dexterity and Dexterity/Strength. A character with a total of 20 weight could receive reasonable bonuses from all three core damage stats. I Will agree that heavy armor "slow" is highly unsused and discouraging for players to be. There should be a trade off or something to make it viable depending on the type of combat one perfers. Indeed, Slow characters should receive a damage bonus simply due to the fact their hits are heavier. they should make a scaling stat like "mobility" but that does the opposite, they could call it "stability" acting the exact same way in sence of scaling. So heavy and slow hits could scale with stability as fast and light ones would scale with mobility. so basicly with the way the game is now mobility is just a bonus to damage if what you suggest is used then perhaps having all that armor will affect your attack speeds as well? that would balance things out nicely.. for instance an armored guy doing jlk at the same time an unarmored mobility 19+ the unarmored guy should hit far sooner than the encumbered armored guy.. just sayin and having all that weight should make stamina regen super slow.. now if you want realism i urge you to put on a joggers vest and ankle weights and race a friend (as long as cardio is not an issue) i can guarantee your friend will not only out run you but will be far less winded than you.. now on the same example lets say you both are hit by a different bus.. the bus will take less damage from your unencumbered and quite dead friend.. however. you with all the weight on will go thru the grille of the bus sustain major injuries perhaps die.. but perhaps not.. you see where im going with this? @R3kk3N I do see where you are going with this, but mobility doesn't only affect damage, it also affects dash distance. That's all very slow to very fast means, just how far you can dash. Instead of causing frame rates to go slower, I would say that Windfall and Stagger style moves receive a damage penalty at high weight, while Kahlt and Forsaken would receive a damage bonus. My goal with the feedback was to present as simple an implementation as possible without going into the lengthy adjustment of animation frame rates. I believe the Devs need to move away from adjusting move sets and defensive abilities and go to the one area that has a large impact on damage, weight and mobility. High weight gear already has several penalties, but I think giving it a damage bonus in a specialized area will bring more depth to the game. @THDante So low stability would be good for stagger? Yes mobility needs to be looked at, been saying this for a while. But your logic behind it is flawed. We don't have weight divisions in boxing because a heavier glove will hit harder, but because not everyone has the same strength. Measure the strength of someone's kick wearing light pants and then measure the same person's kick making him wear a very heavy piece of clothing on his leg. I can assure you he won't hit harder, that's not how physics work. So of course it'll be the same for your character. You cannot make heavier protection increase damage, no one would ever not go as heavy as they can, it would be stupid to have a character with less protection that will also be weaker. The difference between how much you can take when playing fast mob vs playing slow mob is quite huge, if you haven't tried it yourself before, go do it. It's very noticeable. The actual problem is that normal mobility is not balanced at all, it has all of the positives of fast and slow while not having any of the negatives. And that's why people don't use either fast or heavy. Decrease normal stamina reggen, decrease it's mobility scaling, decrease it's walk speed, protection and even dash distance. Make normal what normal should be, a point between glass cannon and durable tank. Not both at the same time. Increase fast mobility scaling on moves while you are at it, honestly the damage difference between fast and slow mobilities is actually not that great. Generaly speaking yes. drunken fist (stagger) has no stability but erratic unpredictability. Its kind of like when you're really drunk and go take a piss and you wobble back and forth or left to right trying to stand still. drunken fist utilises these uncontroled body movements at their advantage. Choosing to do something and something happeneing and going with it are two different things. making a skilled opponent unable to read the drunken fist users next move, since they themselves had no clue what they were gona do next. Having said all that its hard to regain your balance when you tip over and have 100 pounds of gear on you. so yea windfall and stagger would not benefit from high stability as they are not meant to be unyeilding. Measure the strength of someone's kick wearing light pants and then measure the same person's kick making him wear a very heavy piece of clothing on his leg. I can assure you he won't hit harder, that's not how physics work. So of course it'll be the same for your character. Actually thats kinda how physics work but to an certain extent only i grant you. Although small amounts arent that noticable, weight will increase the amount of kinetic energy generated. An the bigger mass or weight of an object will lead to an increase in the potential energy the object possesses. so no, pants wont make the biggest deal per se but 100 pounds of gear would dont you think. In other words If a 200 pound dude hits you its gona hurt more then if a 100 pound dude hits you, assuming they use the same technique. His higher mass will act as a larger conduit to the transfered energy. yes you can just make the stamina drain higher for each move fast or slow should players have low scaling with it. the damage gain will be scaling based again so fast nimble strikes will have no damage increase when used by heavy dudes and drain more stamina. i feel thats a half good thing, a sweet middle where no negatives of each side are present but in consequnce the risk reward ratio should be low( I.E no higher stamina loss on moves but also no damage increase from either "mobility" or "stability" scaling). I feel people who go to the extreme of both direction ( super heavy or super light) should have higher scaling/stamina/damage conected risk rewards. Which i agree is currently not the case as you point out at the end the damage diference betwen fast and slow is not that great. Glass canons and Tanks are'nt the way to go for this game as i've said before i dont want a naked nimble guy to hit me like a 250 pound dude with a brick and i dont want a heavy stone turtle hitting me with fast cardio based hits. @Oimetra I admit my example with boxing is flawed, but it is a simple fact that a person that has more weight, either from body mass or the weight of the equipment, is going to hit very very hard. In my conclusion you will see I pointed out the idea of Mobility, Dexterity and Strength having different weight brackets in which they receive a damage bonus and it's diminishing returns. All this does is take a system that is already in place and give players more depth and flexibility. While reality can be used as a reference, this is a game so a 'as close as' feel is what is desired. And I honestly feel that all the damage being given to Speedy Gonzales is not balanced, simply because the logic is currently flawed. I mean come on, I'm basically wearing steel plates on my legs, that is gonna hurt a lot more than a kick from a guy in gym shorts. Maybe the first 2 times, but when it does hit, you definitely feel it. characters with high strength would not be as encumbered by it. I argue that from a mechanical standpoint it makes no sense for high weight gear characters to deal Less damage. You are still wrong, that's not how physics work. And the problem is that you keep talking about two different people, energy is constant. If you make the same person do a kick with and without a piece of steel plate on his leg, it won't hurt more with it. Someone with more body mass is likely to hit harder because he is likely to have more strength, not because he has a bigger mass, correlation doesn't imply causation. i want every equipment to be equaly good but for other purposes. In my opinion there should be no best middle way to equip but just different equip styles that effect the gameplay but the positive and negativ characteristics have the same impact so nobody could really tell wich is the best way to equip yourself.... that will be hard to develop but the most fun. At the moment i just think that cut protection isnt worth it most of the times. I'm definetly not the best in physics i give you that but I can tell you for a FACT that kinetic energy depends upon two variables the mass of the object/person and the speed of the object/person. The higher the mass and weight, the higher the potential kinetic energy. That said..Again No pants wont change much but a full set of metal gear for example... its as simple as this lets say a very strong guy who has two sledge hammers one of 10 pounds one of 20 pounds but both are the same size and he can swing both with ease. which one does more damage ?.. the 20 pound one. More mass same velocity equals more kinetic energy. Ok i cant stop myself from deriving it now. 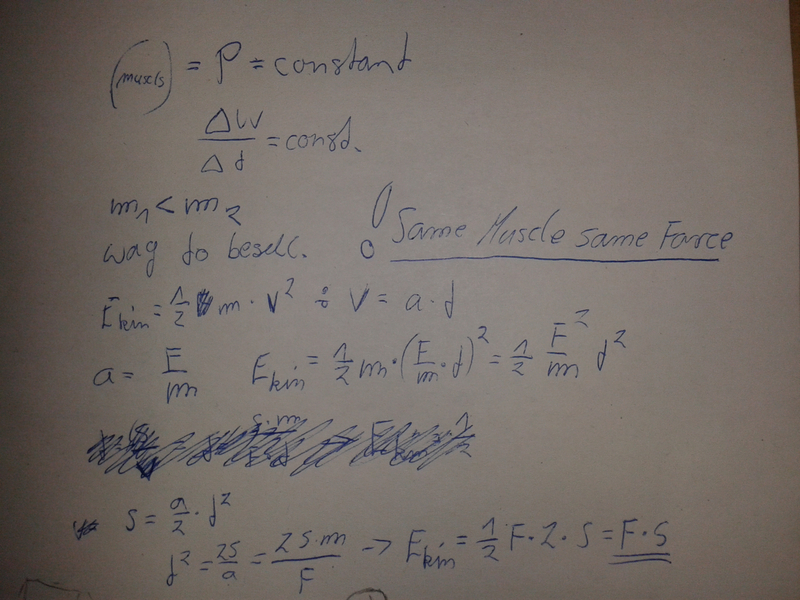 that means in the end the deliverable energy isnt depending on the mass but of the power of the body and the way over wich the bodypart will accelerate. Woa methamos xD nice dedication. il be honest i don't understand half of that as i said im not the best in physics but im pretty sure the formula must include kinetic and possible energy. For a punch or a kick, kinetic energy depends on the mass and speed because kinetic energy is mass and velocity. You must increase one or the other to increase your kinetic energy which will be transferred to a hit on your opponent. though we're going to deep, lets just leave it at Itd be fun if light,med and heavy weight could show more risk reward to encourage diversity. Quote :itd be fun if light, med and heavy weight could show more risk reward to encourage diversity.